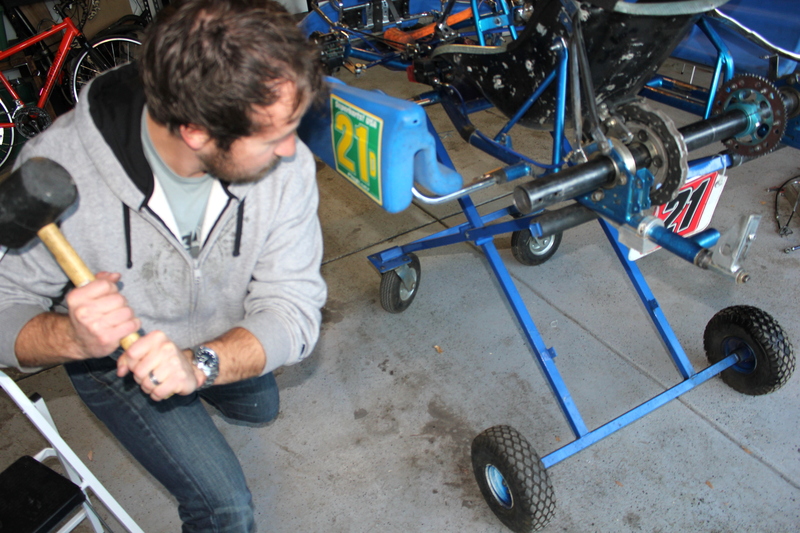 The rear axle in a kart makes up much of it’s handling character. It can totally transform the handling (for better or worse!) depending on its stiffness and the tracks level of grip. As a result, you’re going to be changing axles at some point if you’re searching for those last few tenths, or if (when) it gets bent up in a little incident. 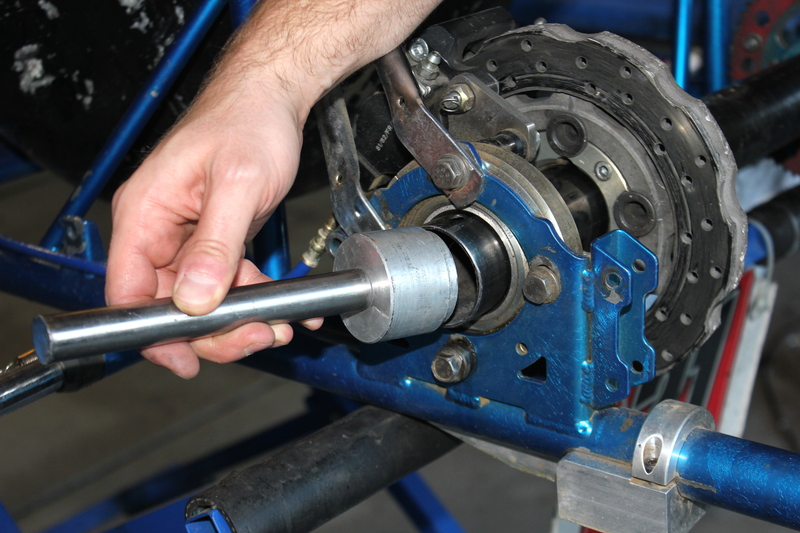 If you’ve never changed an axle before, it’s a good idea to run through the process at least once before you’re faced with a bent axle at the track and no idea how to change it. It’s pretty straight forward, but there are a few tips you’ll want along the way to avoid any surprises. 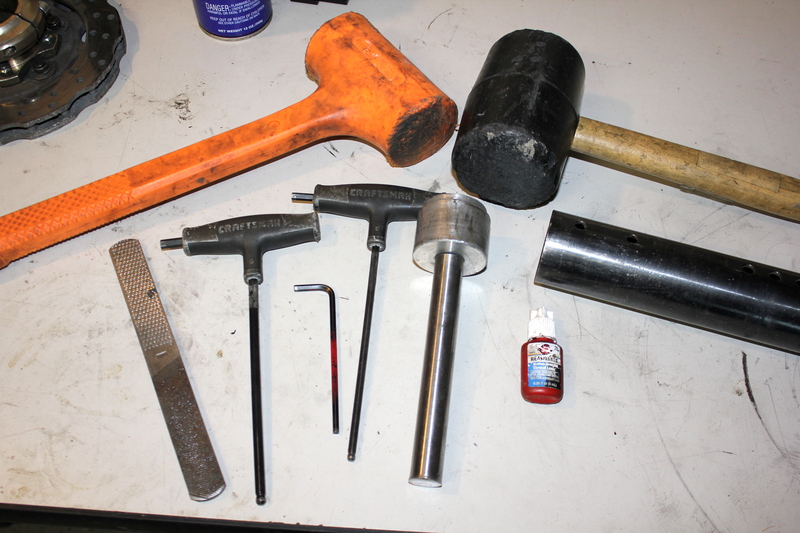 The tools: deadblow hammer, rubber mallet, metal file, 4mm, 5mm, 6mm hex t-handles, 50mm axle removal tool, ‘blue’ thread locker, & an axle. Step one would be to remove the rear wheels, either from the hub, or just remove the hub/wheel assembly all-together. Removing the wheels with hubs attached is quicker since it saves an unnecessary step. If they’re a little sticky and don’t want to come off, you can place a long flat head screwdriver in the slot of the hub and lightly tap with a hammer. Be careful with the angle on this, since it’s very easy to damage both hub and axle. You want the screwdriver as parallel to the axle as possible! 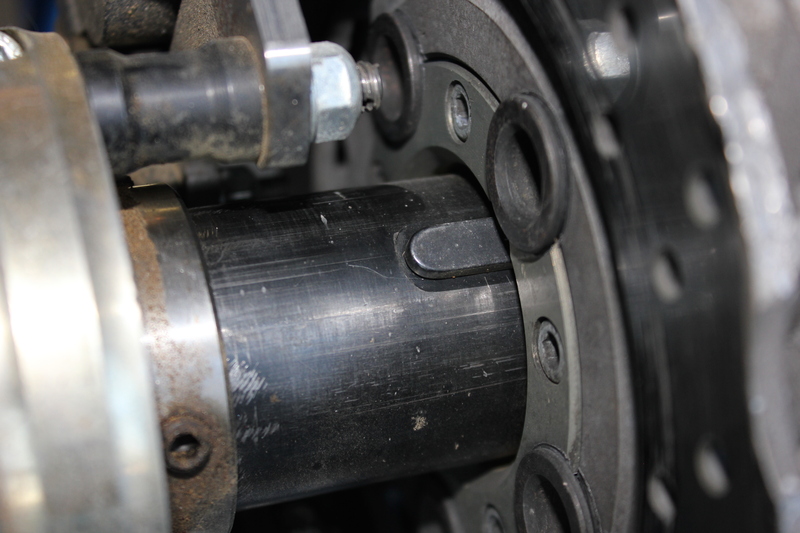 The axle can be secured in place one of a couple ways: set/grub screws in the bearings, or collars. My preferred method is set screws (less rotating mass), but if you’re working with collars its just as easy to remove. Remove all set screws, usually anywhere from 1-4 per bearing. Be sure to loosen all hardware still on the axle. Back the pinch bolts out enough so that things like the brake rotor carrier can move freely along the axle. After everything is nice and loose, i like to take this opportunity to spray some WD-40 into the space where the bearing meets the axle, to ensure good lubrication and easier removal of the axle. You can put a little squirt into the set screw hole for less mess. A little WD-40 helps everything move again. DON’T GET ANY ON THE BRAKES!! Verify that everything that can be removed is removed (hubs, gears, keys), and everything that can be loosened is loose. You can now start to remove the axle. Due to the placement of the brake rotor keyway, the axle can only be removed in one direction, and that’s (driver’s) left to right. This key means that the axle won’t come out on the left side. It needs to go right! Here’s where it can get tricky. 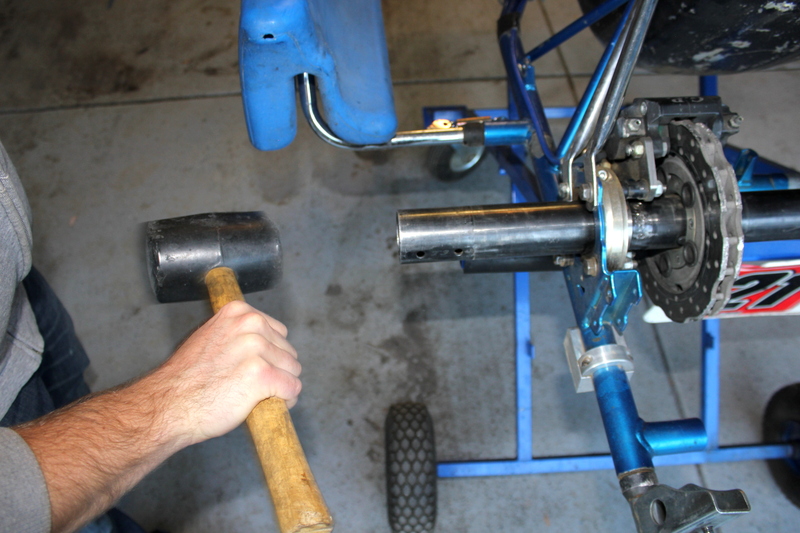 Kart axles rarely seem to slide out smoothly, so you may need to motivate it a little bit with a rubber mallet. A few light taps on the end of the axle and it should begin to slide out. In a perfect world (or a new kart) you would be able to pull it out with your bare hands. The brake rotor carrier is usually the bottleneck, as it will move a few millimeters with the axle, and then get stuck on the right side of the caliper. You’ll probably need to move it back to the left multiple times during the process, this is especially troublesome with floating rotors. Make sure to watch for falling keys when they clear the brake rotor carrier. Its a good idea to hold the brake rotor too, so it doesnt fall on the ground. Heres where the axle removal tool comes in handy. 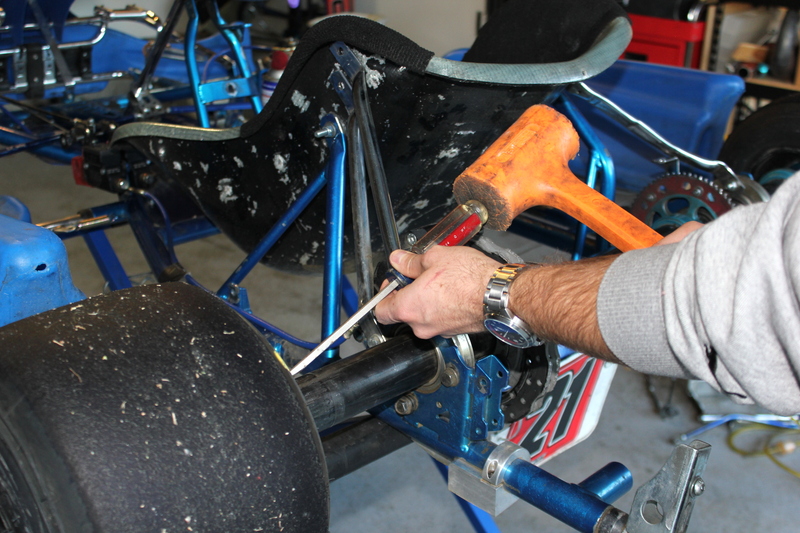 The tool will slide through the bearings while allowing you to still hammer on the axle. If it still wont slide out with some taps from your rubber mallet, you may need to bring out the big guns (a small dead blow hammer). Be VERY careful to not hit the end of the axle too hard, as too hard of a hit (or too soft an axle) can mushroom at the end, and then you might have to cut that bit off with a hacksaw. Incidentally, the cheap 2-3lb orange dead blow or rubber mallet from Harbor Freight work great for this, the outer casing is very soft (probably because they’re cheap). If you’re worried about damage to the axle, it’s best to use the axle removal tool throughout the whole blunt force portion. Motivation in progress. Just kidding, you don’t really need to wind up…remember; light taps! Don’t be an orangutan with your hammer (which is also a good life tip). Light taps (sometimes medium) is usually all thats necessary. 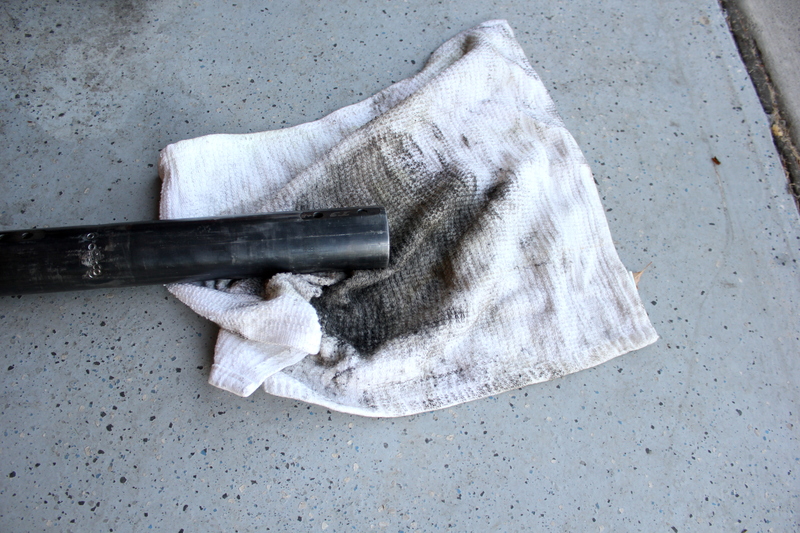 With the axle out of the kart, take some time (if you have it) to clean it up a little. Axles are always filthy nasty with grease, and the set screws will sometimes leave little burrs behind. 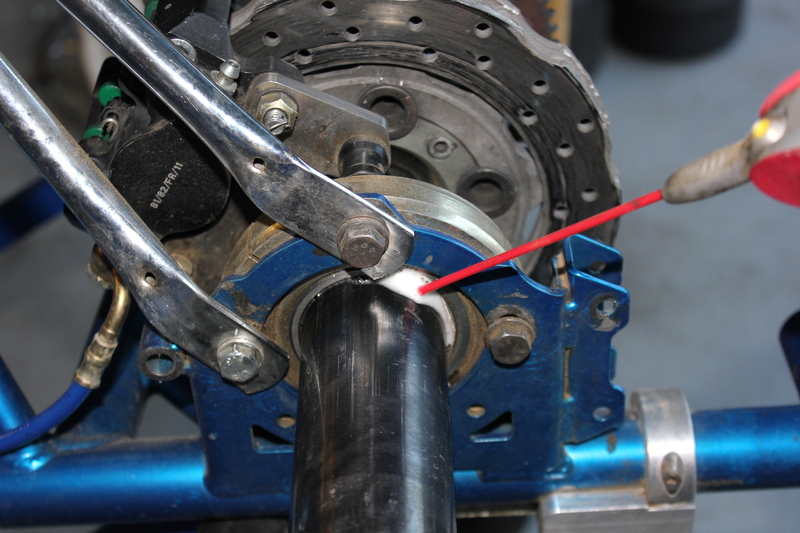 Take a rag with some Simple Green (or your cleaner of choice, I avoid brake cleaner because it eats at the nice black finish on GP/CRG axles) and wipe down the axle, and take a very fine file to file down the rough spots created by the set screws. The grease means it’s fast. Set screws will almost always leave a little rough spot, so just lightly file it down with a fine file. Installation is essentially the same as removal, only reversed. 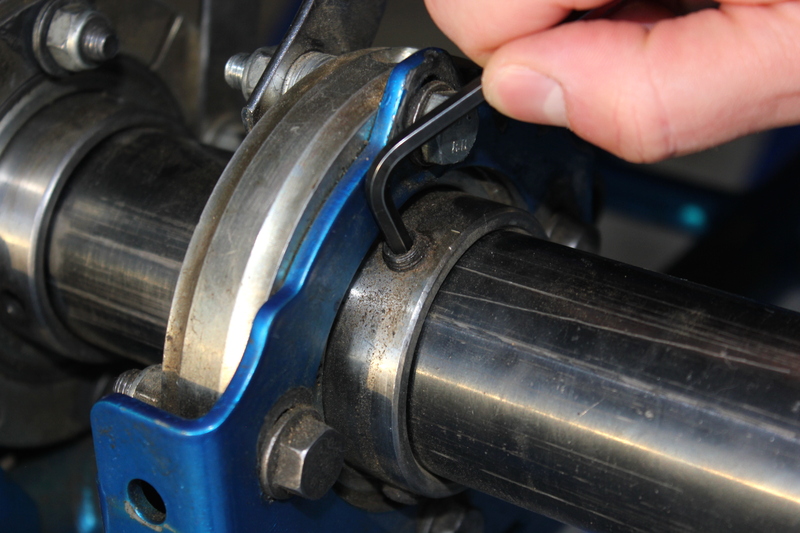 Be sure to clean off the old, and apply new thread locker to the set screws before tightening them snug. 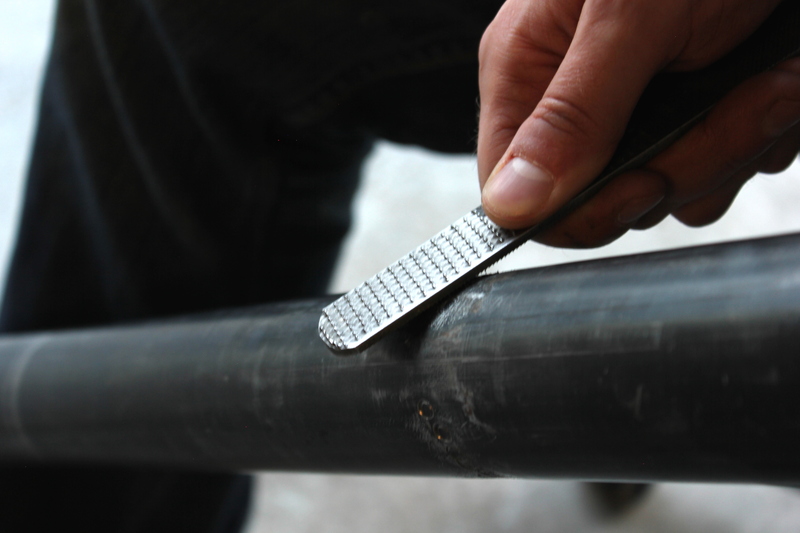 Also be sure to measure things and make sure both ends of the axle are an equal distance from the outer-most bearing hanger. If you removed the bearing carriers, ensure that they were all reinstalled at the same height in their hangers, otherwise installing the axle is going to be difficult. And that’s it! If you have any questions on the process – or comments – let us know below!